Today I am thankful for crockpots. 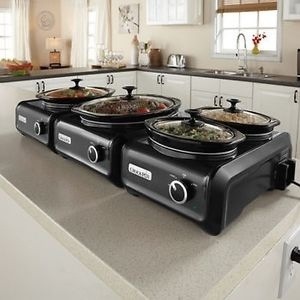 Most of us already know that crockpots are great tools to use when you want to prepare a slow cooked meal without being tied to a stove or an oven all day. And more often than not they are associated with cooking various types of meats and poultry, such as pot roast and chicken. But crockpots are perfect for preparing other items as well, including beans, rice, soup, chili, dips, and even hot beverages such as apple cider. As a person who loves to cook but has a schedule that keeps her rather busy, I do not always have the time to spend hours in the kitchen. But I enjoy slow cooked meals with tons of flavor and depth. Thankfully, I have found that having a crockpot is a perfect solution to that dilemma. I can season the meat, poultry, beans, or whatever it is that I want to prepare, put the necessary ingredients into the crockpot, turn it on and then go about my business. And hours later, after plowing through my to-do-list for the day, I can come home to a scrumptious aroma and a delicious meal. I am becoming hungry just thinking about it.